I decided to compete in a triathlon over the winter because it gave me something to do during the cold weather while most of my friends headed to the mountains to ski. Unfortunately for me, the weather was mild, and I could have been hiking!! The good news is, I chose to compete in a triathlon at Lake Mead National Recreation Area, so I could do some mini hikes, and they were great! Not wishing to wear ourselves out prior to the triathlon, we picked a short, flat walk at St. Thomas in the Northshore area. St. Thomas was a thriving farming community established in January of 1865. Over time, the population grew to a few hundred people. The town’s main street featured a post office, grocery stores, a church, an ice cream parlor, and several car garages. Around the corner was a school. When the Hoover Dam was built in 1928, members of the community were told they would need to relocate as the dam would cause the Colorado River to back up and submerge the town. By 1938, St. Thomas was inundated with the waters of Lake Mead. 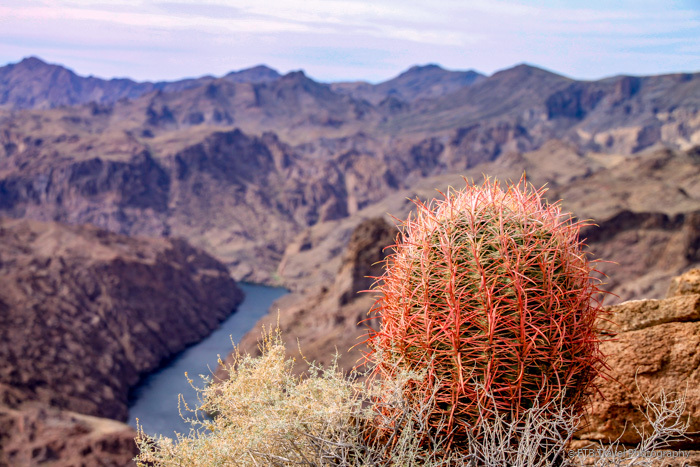 The level of Lake Mead fluctuates based on the snowmelt from the Rocky Mountains. As such, the town surfaces during low water years. After being submerged throughout the 1980’s and 1990’s, the ghost town reappeared in 2002 and remains above the surface. Steve and I followed the 2.5-mile sandy loop peppered in shells that led us along main street past remnants of the town. Not much remained, mostly foundations to a few people’s homes, an engine house, a hotel and more. The school and the ice cream parlor seemed to fare the best, which wasn’t too well! It was interesting to see the town, but I felt sorry for all those people that had to give up their homes and community. I wonder when it will be back underwater. The second hike we completed was the day after our triathlon, thus again we looked for a short, easy trail. We found a hike called Owl Canyon in the Lakeshore area of Lake Mead National Recreation Area. The 2.2 mile out and back trail was described as moderated with 300 feet of elevation gain. As we descended the trail from the parking area, we came to a junction of several trails zig-zagging through the brush in every direction. We followed the most used path and ended up in the right place, a beautiful slot canyon. The side walls did not seem as solid as most other canyons I’ve visited. They seemed eroded. Soon we realized, this area was once underwater as well as we crunched along the sandy trail also laden with shells. No wonder the trail wasn’t shown on the park map! The narrow canyon was definitely the prettiest part of the hike. A few desert flowers were still in bloom, so that was nice. The wash wasn’t too exciting though the culverts traveling beneath the road were kind of cool. While I wouldn’t rank it as the best hike I have ever done, it was nice to get out and stretch our legs. We had time for one more hike before we left Boulder City. Steve’s legs were still shot from the race so we picked what looked to be another easy hike called Liberty Bell Arch with seasonal access near Lake Mohave on the Arizona side of Lake Mead National Recreation Area. It was 5.5 miles with only 275 feet of elevation change. We weren’t exactly sure why the park rated it as difficult unless it was due to the hot desert sun. We soon found out what 275 feet of elevation change meant. We just didn’t get higher than 275 feet above the trailhead. It didn’t count all the undulations of the rocky canyon and wash! We started walking down hill through the wash. We found the first trail marker where we continued straight though the arrow pointed diagonally which was slightly confusing given another unnamed trail went off to the right. Eventually, we came upon the next trail marker where we did turn right and began ascending slightly. We kept climbing and soon we reached some leftover mining equipment and the entrance to a magnesium mine. I always find mines and the people who found them interesting. How does someone decide to wander over uneven terrain through the canyons and desert to settle on a spot to dig a hole? bottom left corner on right side of river is where we hiked! Anyway, after inspecting the old mining area, we continued toward Liberty Bell Arch. We descendent the hard dirt path to the flats only to climb back up again. We had hiked nearly two miles and still couldn’t spot the Liberty Bell Arch in the expanse of the colorful canyon. Finally, as we climbed up the next hill we spotted it. Sadly, it felt anti-climatic was we approached it. It didn’t seem that big and the main trail didn’t lead to the opening of the arch. It was clear a short scramble in the gravel through the brush would get us closer, but we didn’t really feel like adding anymore distance to the hike. Next Post How to Eat, Drink and Celebrate in New Orleans!